Exercises train to block transport and disarm police missions. The terrorist organizations "DNR" and "LNR" conduct exercises aimed to terrain the inhabitants of the occupied territories how to block OSCE police mission. According to separatists websites, such "training" was held in Luhansk on 19 July. Under the excersise scenario, a two-thousandth rally blocked the movement of a "notional foreign armed mission" which, in turn, tried to "take some of the protesters as hostages, and attempted to disperse the demonstrators using water cannons and petards." On Wednesday, a similar exercise took place in Shakhtarsk. 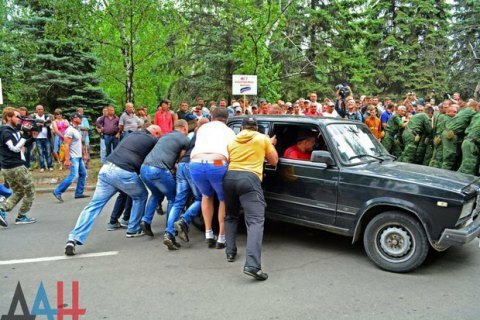 Residents of the city have been taught to block traffic, and disarming "an armed mission". The introduction of a police mission in Donbass is a key precondition for holding the local elections in Donbas. OSCE has stated preparedness to deploy armed mission provided all parties agree. Earlier, Russia has strongly opposed the deployment of an armed police mission. Russian Foreign Minister Sergei Lavrov called the security problem far-fetched and said unarmed OSCE observers will be enough to secure the ballot. After the negotiations in the Normandy format, Russian President Vladimir Putin said that Russia agreed to the deployment of armed observers, but, as the Kremlin later clarified, only on the front line. This issue is slated to be discussed at the upcoming meeting of the Normandy Four leaders. Russia so far has agreed that observers cam be armed with pistols for self-defense.